Ever since his trailblazing 1957 debut, Frost on the Sun, D.G. Jones has been in a class by himself. For over five decades he has given us poems distinguished by their fast-talking wit, elegance, and playful virtuosity. 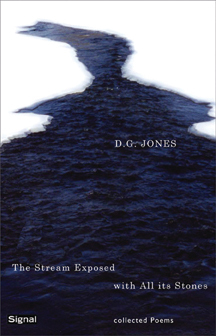 The Stream Exposed With All Its Stones brings together Jones' nine acclaimed books of poetry, each steeped in his lifelong concerns with nature, history, popular culture, mortality, and language. Animated throughout by what George Bowering has called Jones' "great ear and great eye," this career-spanning volume reveals the full extent of Jones' exemplary achievement and confirms his rank as one of Canada's major poets. D.G. Jones was born in Ontario in 1929. He has won the Governor General's Award twice. His poetry has also won two QSPELL Awards and the A.J.M. Smith Award. Jones retired from teaching at the Université de Sherbrooke in 1994. He now lives in North Hatley, Quebec, where he continues as editorial advisor and translator for Ellipse magazine.